San Diego Skyline Views from Coronado - TourGuideTim Reveals San Diego! 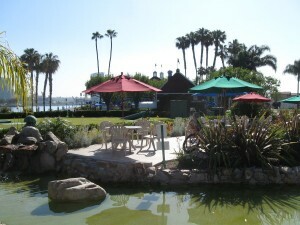 Highlights for Centennial Park & The Coronado Ferry Landing Marketplace: From a small, peaceful park on Coronado Island, you will enjoy one of the most beautiful skylines in the world. It doesn’t have the size of New York or the mystique of Sydney. 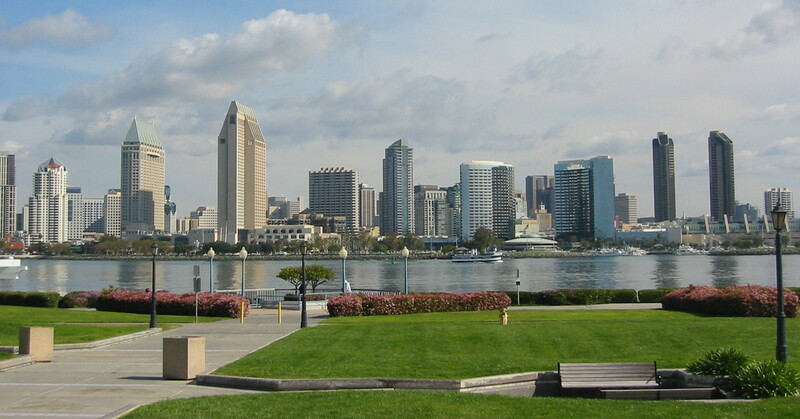 However, San Diego is one of the most modern cities in America. With the sparkling San Diego Bay in the forefront, separating Coronado from San Diego, and beautiful sunshine, you get to enjoy what appears to be near perfection. There are no dilapidated buildings or eye sores to muddy the view; just a young city full of modern buildings sitting along a calm San Diego Bay. 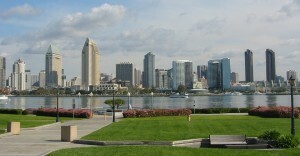 Looking across the San Diego Bay towards the right side, you will see a long building with white-sail tops. This is the San Diego Convention Center. The tall tower to the right of the Convention Center is the new Hilton San Diego Bayfront Hotel. If you look a little further back between the Convention Center and the Hilton, you will see Petco Park, home to the San Diego Padres Major League Baseball team. Looking straight ahead, you will see two wide glass buildings on the waterfront. This is the San Diego Marriott Hotel & Marina. Looking to the left of the Marriott, you will see two tall and thin, tan-colored buildings. This is the Manchester Grand Hyatt, the largest waterfront hotel on the West Coast. Most of the other high-rises are residential towers. Watch for jets flying in low behind these buildings as they approach the San Diego Airport. Looking to the north on the island of Coronado, you will see the North Island Naval Air Station. This is the birthplace of naval aviation and is the home port for three nuclear aircraft carriers. 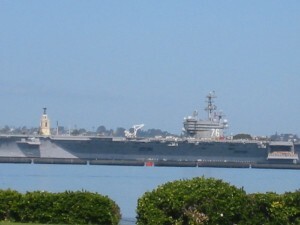 Of the 21 aircraft carriers in the world, you may see up to three at Naval Air Station North Island. Recent carriers include the USS Nimitz (CVN-68), USS Carl Vinson (CVN-70), and the USS Ronald Reagan (CVN-76). Enjoy this exclusive up-close view of something very few people get to see with their own eyes. Sometimes you will see an aircraft carrier with different markings because other carriers do stop by San Diego from time-to-time. After visiting during the day, come back to enjoy the beautiful lights of the city at night. 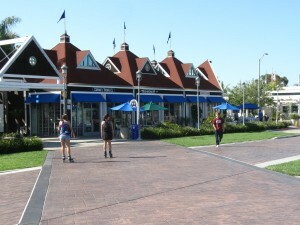 Coronado Ferry Landing Marketplace – Adjacent to Centennial Park is the ferry landing for the San Diego to Coronado Ferry. (See more information below.) This is part of a larger retail complex offering dozens of tourist related shops and restaurants. There is a variety of dining choices ranging from Burger King to Il Fornaio (great Italian) and Peohe’s (great seafood). Il Fornaio and Peohe’s both offer great views of the San Diego skyline. The setting and the food will definitely make this a meal to remember. The shops are open from 10AM – 8PM while the restaurants stay open later into the night. Coronado Ferry – The Coronado Ferry is a great way to visit Coronado while enjoying San Diego Bay and the downtown skyline views. The Ferry runs hourly each way throughout the day. 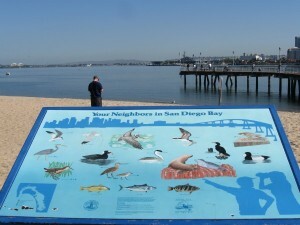 It takes only 15 minutes to cross the bay from attractions near Broadway Pier to the Coronado Ferry Landing Marketplace. 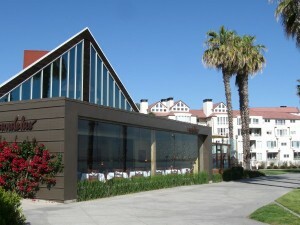 The Hotel del Coronado is 1.5 miles from the Coronado Ferry Landing and can be reached by foot, bus, pedicab, or taxi. Directions from Google Maps to the corner of 1st Street and Orange Avenue in Coronado, CA 92118. This places you at Centennial Park. There is free street parking as well as free parking at the adjacent Ferry Landing Marketplace.